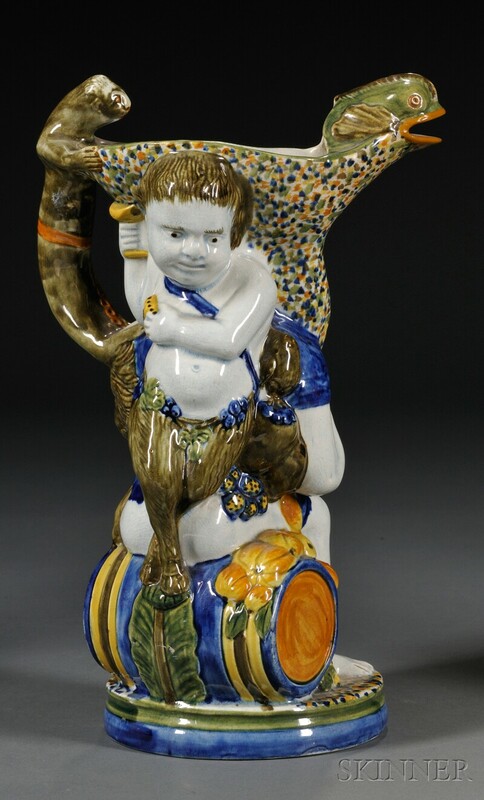 Pratt-type Staffordshire Pottery Pitcher, England, c. 1800, typical underglaze enamels, the scantily clad Bacchanalian figure seated on a barrel, the figure of a young Pan on the reverse, with seal handle and dolphin spout, ht. 11 5/8 in. Restored chips to lips of dolphin; small hairline to one side of handle; 1/4" footrim chip; 4" hairline running under base and up along footrim.